From Tuesday to Sunday, 9.00 a.m. - 08.00 p.m.
Free entrance for kids up to 18 years. The history of the National Archaeological Museum of Cagliari started in 1800, when Ludovico Baylle proposed to the viceroy Carlo Felice, the creation of a museum in order to collect the archaeological collections and to preserve the island Natural History samples. His project was approved, and a room of the Viceroyal Palace was destined to the Natural History and Archaeological Cabinet, under the direction of Leonardo De Prunner. This first collection, which was enriched through findings donated by privates, was opened to the public in 1802. A few years later, in 1806, also Carlo Felice donated all his collections and because of the significant objects increase, it was necessary its transfer into a Mineralogy Museum room. In 1806 De Prunner was replaced by Ludovico Baylle, but soon it was switched with Gaetano Cara. He held it until 1858, and in order to enrich the collections, he was also charged, from 1841, to conduct excavations at Tharros archaeological site. Only in 1859 the archaeological part was separated from the Natural History one and Patrizio Gennari was nominated as director, then replaced again by Cara in 1862. In 1859, the Canon Giovanni Spano, founder of Sardinian archaeology, also donated to the museum his large collection. Over the years, the collection continued to increase, thanks to donations and finds of those years. In 1875, Spano was nominated Museum and Sardinian Archaeological excavations Director. He was succeeded by Philip Vivanet and during his leadership were acquired Timon, Caput, Cara and medal Cugia rich collections. In 1883 the historian Ettore Pais completed the first Royal Museum inventory. Two years later, the collection was transferred to Vivanet Palace, in Rome, where he remained until 1904. At that moment, the museum was grown and deserved its own location: it was built according to Dionigi Scano project and located in Piazza Indipendenza, reinventing the building that, until the early twentieth, housed the mint and the armory. It was Antonio Taramelli, Superintendent of Sardinian Antiquities from 1901 to 1931, to create the new exhibition and the museum was divided into different rooms. They were dedicated to pre-Roman Sardinia and Punic Sardinia, the living room was divided into different categories, Punic and Roman objects, and finally there were three subject rooms: the lapidary, the Roman Christian room and the medals. During those years, there was an extraordinary enrichment in the number and quality of exhibitions. In the 30s and 40s twentieth century, several directors alternated: Doro Levi, Paolino Mingazzini, Salvatore Puglisi, Massimo Pallottino and Raffaello Delogu. In 1959, Gennaro Pesce became superintendent and held also the Museum until 1967, mainly making excavations in Nora and Tharros. Gennaro Pesce successor, Ferruccio Barreca, had the delicate task of investigating the sites of Monte Sirai, Antas, Bithia and Sulci. The museum was then subject to various rearrangements, with exhibition of prehistoric objects of the universitarian research and those found during the new digs. In 1986 Barreca, after his demise, was succeeded by Vincenzo Santoni, who organised the transfer from the old location, now insufficient for space and services, to the new and prestigious Citadel of Museums. 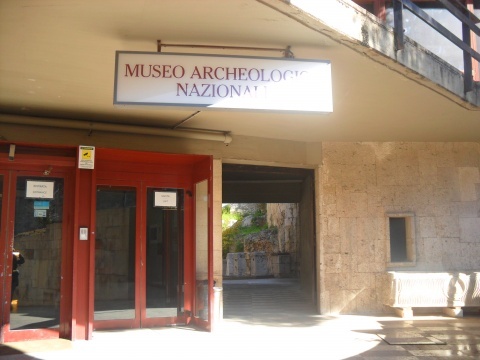 The idea of creating a new National Archaeological Museum in the current Citadel of Museums was born in the 1950s, with the intention of creating a multi-cultural structure, upholding the Museum, the National Gallery, the Department of Archaeological Sciences and Historical Artistic, the Institute of Sardinian Studies. The structure, designed by the architects Piero Gazzola and Libero Cecchini, was inaugurated in 1979, but since 1986, it was decided to adapt the new structure according to occupancy and security standards, until the opening in 1993. The new National Archaeological Museum of Cagliari, whose exhibition was curated by the archaeologists Carlo Tronchetti and Luisanna Usai, has four floors: the first is devoted to an educational-didactic presentation of ancient cultures succession in Sardinia, starting from the Neolithic period. It starts with the exhibition that represent the most important Sardinian prehistoric cultures: Bonu Ighinu (4000-3500 BC) with findings from Cuccuru is Arrius, Ozieri with its typical ceramics perfectly decorated and polished, Abealzu, Filigosa, Campaniforme or Monte Claro pot. Therafter we find the nuragic civilization, which is represented by countless artifacts among which it is possible to admire the bronzes collection, that collects samples from all over the island, including those of great value representing the tribal chiefs, usually in larger size and with typical attributes of power. Then we have the Phoenician, Punic and Roman civilizations, extremely important for Sardinian history; between the most representative findings there are traditional pottery and fine craftsmanship objects, such as the famous Phoenician necklace in faïance (glassy) composed of large pearls in which the central ones have the form of bearded heads. The ground floor ends with a collection of Punic and Roman coins and a didactic showcase for blinds. The other three floors are dedicated to the illustration of different territorial areas, with the exposition of the material found in different locations according to topographical criteria, with showcases dedicated to specific archaeological sites. Among them there are very important areas dedicated to Su Nuraxi Barumini and the Sanctuary of Antas, where the ancient Sardinian religion merged with the Punic before and the Roman later, and with the Phoenician city of Sulci and Monte Sirai, where was discovered the famous and rare statue of the goddess Astarte . The National Archaeological Museum of Cagliari joins the project "Night at the Museum ", created by the Ministry of Heritage and Cultural Activities and Tourism, in cooperation with the Directorate for the Promotion.